Proposed route: JCT I-10/AZ 51 around Tempe, Mesa, and south of Phoenix to JCT I-10 near 51st Ave.
ADOT originally signed AZ 202 with white-on-brown signs, but as you can see it was a pain keeping the sign shop and ADOT's contractors on the same page. Sun fade was a signifigant problem as well. 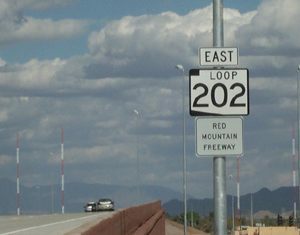 ADOT finally gave up, and in 2002 decided to make all the Loop route signs (AZ 101, AZ 202, and AZ 303) the standard black-on-white, albeit with "LOOP" instead of "ARIZONA" at the top. This was first instituted on the Country Club (AZ 87) to Gilbert Rd. 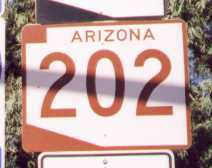 leg of AZ 202. It's fitting that there was still one last hitch. The signs originally posted were the white-on-black signs. They were replaced a few weeks later with the black-on-white signs, although there are a couple left on the cross streets. I don't believe the old color signs will be replaced until their lifespan is up, so they should be around on the existing freeways for a long while. 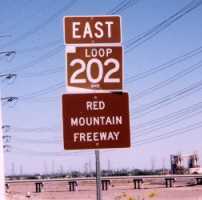 The Red Mountain Freeway's bridge over the Salt River is about a mile long. The river isn't that wide; the road goes across the river lengthwise. This was done to avoid the old Tri-City Landfill on the north bank, which is considered a hazardous site. Part of the AZ 101 Price Freeway interchange is over the river as well. 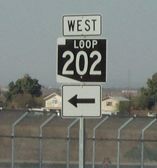 There is an unmarked SPUR AZ 202 from AZ 202 and Priest Dr into the east end of Sky Harbor Airport.